The snowy conditions outside set a perfect stage for the Winter Classic rematch between Bruins and the Blackhawks at TD Garden on Tuesday night. 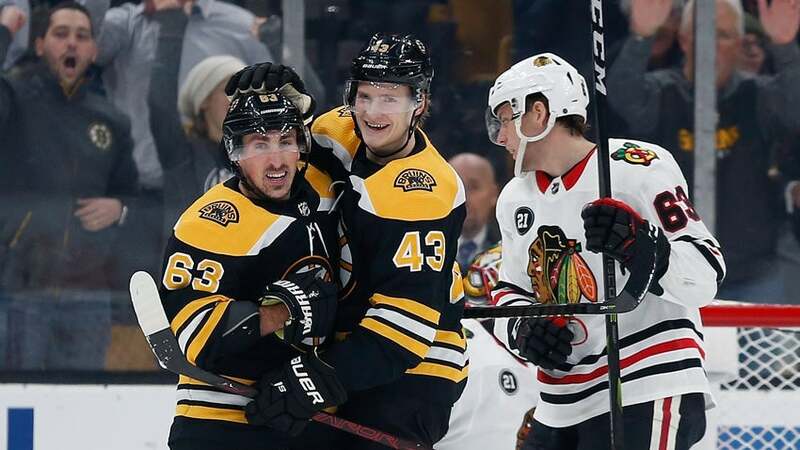 Chicago rolled into town boasting a 7-game win streak, just in time for a Bruins team that lost leading scorer David Pastrnak to a thumb injury. Yet much like New Year's Day, the Bruins got the best of its Original Six counterparts, though they did not wait until the third period to seize control. Despite trailing on a Tuukka Rask's blunder, the B's exploded out of the gates and set the tone with three first-period goals. 9659002] "W e got results tonight. The buy-in, I thought our fourth line was physical, played their game, controlled pucks low. [Patrice Bergeron’s] line was Bergy's line. They matched up today against [Jonathan] Toews, "Bruce Cassidy said following his 100th win behind the Boston bench. " We did a real good job with that, especially the second period. The goalie made some terrific saves, but we stuck with it and eventually did get rewarded. " Here's what we learned as the Bruins ran their win streak to three just in time for their five-game West Coast trip. Pastrnak's growth into a well-rounded player is one of the highlights of the season. The fifth-year forward leads the team in goals (31), led the team in points (66) prior to Tuesday, and was one of two players (with Krejci) to suit up for every contest before sustaining his thumb injury following a team event on Sunday. The Bruins will most certainly miss Pastrnak's skill set and production the next two weeks (at least). They'll need to showcase their depth. Tuesday's six-goal outburst – with tallies from five different players – marked a step in the right direction. "It obviously does not help when your best forward goes down, but we are pretty confident in our depth," Rask said. .
Now, the Bruins shift their focus to the upcoming 11-day road trip, a gauntlet of teams fighting for playoff positioning. "We're going to need contributions from everybody with Pasta going down for a bit, "Marchand said after tallying a goal and three assists. With his sophomore slump rearing its ugly head, Cassidy had no choice but to bench the defensively reliable Heinen. But something has happened to the 23-year-old that has drastically changed his game for the better. We call it the Patrice Bergeron effect. In another attempt to find more lineup balance, Cassidy moved Pastrnak to the second line with Krejci and a rotation of left wingers, featuring DeBrusk and Peter Cehlarik. Heinen moved up to skate with Bergeron and Marchand, and looks like a completely different player. "I think I'm just trying to think less now, not putting too much pressure on myself. It's obviously an honor to play with those guys, and it's a great opportunity, "said Heinen, who has three goals and four assists in his last four games. "I think my mindset is not to try to look for them all the time, too much, or not try to get away from just playing on instincts." Heinen was terrific Tuesday, with a goal and two assists . He's looking less timid and more confident in his decision making, as seen from his assist on Cehlarik's fourth of the season to give Boston a 5-3 lead. "I think he understands that he's been given a nice opportunity here, to the dirty areas for that line, getting rewarded, making plays around there. You go there enough, especially with those guys, the puck will end up there, so good for him. I'm happy for him, "Cassidy said. "He's a good kid, he works hard, he's a pro, he's accountable away from the puck, he's willing to block shots when need be, and this is part of the game that's more enjoyable." DeBrusk once sat third on the Bruins with 14 goals. Then he stopped scoring entirely. Well, he's finally back on the scoreboard again. The second-year forward gave the Bruins a 4-1 lead after tipping in Krejci's pass for his first goal since Jan. 8. "It's something that's long overdue and something that I needed, to be honest with you. Obviously, did not do my normal celly, but it was just nice to get on the board to help the team, "DeBrusk said.
" Personally, very frustrating. . . It actually got to me a little bit, but at the same time I understood that there are peaks and valleys to your seasons and that what does not kill you makes you stronger, and when you get through it, it's going to be a lot of fun, and hopefully I've gotten through that. " A visibly upbeat DeBrusk took a big step forward. The Bruins need similar efforts out of their second-line left winger during Pastrnak's absence. "He's a streaky guy," Cassidy said. "He's still young, so I think it affects him mentally if you're not on the scoresheet, so I think it, hopefully, it's a sign of more, but we'll see."